What is 2.5mm Aluminium Tread Plate? 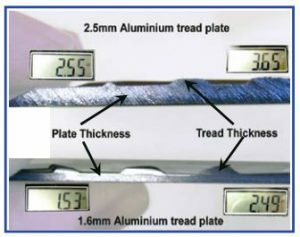 Aluminium tread plate – the thick of it! The 2.5mm refers to the plate thickness not the tread thickness. The high strength of the material is achieved with the 2.5mm aluminium tread plate. Thinner 1.6mm and 2.0mm tread plate may have the same external finish but is offers far less strength. 5052 is marine grade aluminium alloy. Marine grade alloy is great for hard wearing outdoor applications. 5052 alloy contains a significant magnesium component. It becomes harder with age as well as work hardening. For applications exposed to hard knocks or an abrasive or marine environment 5052 alloy is a superior product that will outlast 3003 alloy. 3003 alloy is a bit cheaper to produce because of the recovered component content and the use of maganese instead of magnesium. These two metals may sound similar but they create a very different finished product. This softer material is easier to work and cheaper on tooling. 3003 is a great material for gutters, cladding, and shop fitting extrusions. It starts out at under half the hardness of 5052 alloy. All propeller, diamond plate, and a lot of 5 bar aluminium tread plate boxes are now made from 3003 alloy. Ute Safe is the only company able to boast that every single box manufactured has been made from 5052 marine grade alloy. At Ute Safe we can not only stand by our boxes, we can stand on them.